Naive Knitter has a special little 'thing' going on over at her place involving people's workspaces and artists studios. She's interested in the things that people have around them, which keep them company and watch over them while they work. 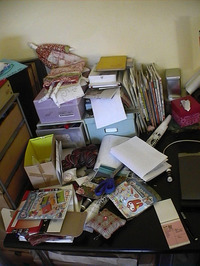 How could I resist the temptation to show you my mess? Everything to do with my creative life over the last few weeks is piled like crap at the side of the desk, and everything is overflowing. A couple of hours of cleaning today, brings these results. 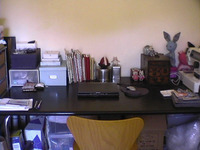 A clean desk, but perhaps without some of it's personality? I'm intrigued by Naive's idea to photograph studio spaces, because I am intrigued by what the viewer picks up on in a space they know nothing of. What strikes you as you look at these? Does what you see change what you think you know of me? Let's look a little closer, and I'll let you into my world a little. These are my boxes. I love boxes. I love putting things in boxes. I like the idea of having boxes to put things into. Boxes equate to orderliness for me. 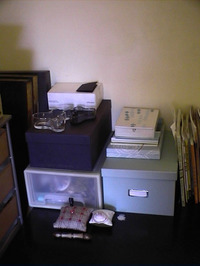 Under the desk, there are quite a large number of boxes with material and a very large wool stash in them. The big dark box has art materials in it - pens, paints, paper, and inks (it's one of many). The translucent box beneath it has sewing paraphenalia and various knitting needles in it. The blue box next to these 2 has paper stuff in it and little things I've made that don't have a real home. On top of that box are other boxes of stationery by Lotta Jansdotter. Yes, I have the entire set. Also on top of this box is a fantastic notebook. Because my other unconscious obsession is notebooks and sketch books. I have a lot. Too many. Love them. I love the crisp white pages, the as-yet-to-happen experiences which will fill them, the sketches which will fill the blankness. And I love the morbid fear I have of filling them with anything. I like the blankness of them, the stark emptiness, and the silent promise they hold. I could explain the psychological meaning behind all that - I did actually sit down and think why I never write in any of them or sketch in them, and I do know why, but that's too much to reveal. So next to the blue box are more notebooks, more empty blankness, and a stack of japanese craft books, some knitting books (only a few, the rest are elsewhere), and some of my newer book purchases which I am in love with and which are inspiring me. And here is my little Temple of Inspiration - this is my El Santo, although it's really a little collection of things, and none of them are permanent. The only permanent thing, is the antique japanese calligraphy box. I bought this for my husband for his birthday when we first started living together. It's now become my sewing box, or rather, my trim box (I can already imagine the google searches which will dissapoint with that last bit. 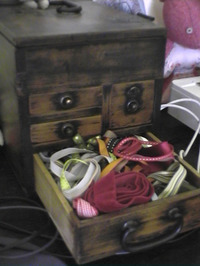 I'll add those visitors to the very dissapointed people looking for pornagraphic socks), and I keep my hoard of ribbons and buttons and beads in here. There's something fitting to have fine silk and velvet ribbons sharing space with something beautiful and serene and slightly rough like a calligraphy box. I love it's colour, its smell and its texture, and it's oldness. I like the fact it goes with everything in my house, and stands alone by itself as well. 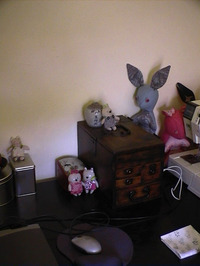 I use it as a podium, and objects I find beautiful at this moment in time get to be on it. Right now, it's an antique japanese vase, and a tiny chinese shard box. Watching over them, and me, are my little kitty's - they'll stay for a wee while, then move on to new homes, and be replaced by something else. A room of one's own. You are very lucky. Blast my procreation urges. If only I didn't have so many children I would still have a writing-sewing-knitting-music-painting room, and time to be in it. I think it is time to build a shed in the back garden. But I doubt I could keep it as tidy as you. That Japanese box is stunning. i just saw one of your postcards on kraf-o-la's site and it is so beautiful. very well done! There was me thinking your dolls really lived in a some kind of La-La Wonderland - and then I see them cast into a corner and not even surrounded by sweet wrappers and copies of Vogue. It just shows that the best pictures are in the mind, although I am fascinated to see your space and take comfort in the fact that you have to have MAJOR tidying-up sessions to keep it under control. 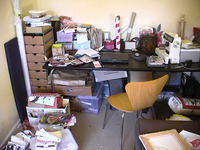 My tidying usually happens when I can't see the floor or, worse, can't get past the door. Hey it's one of your back tacker pals-- i will be sending out some fun fabric and other goodies this weekend!